Discover the cosmos! APODViewer7 is your daily Astronomy Picture of the Day viewer and picture saver. APOD is a website at http://apod.nasa.gov/ which each day a different image or photograph of our fascinating universe is featured, along with a brief explanation written by a professional astronomer. APODViewer7 allows you to quickly view and save the images to your phone for later use as backgrounds, wallpaper, or just to view later. 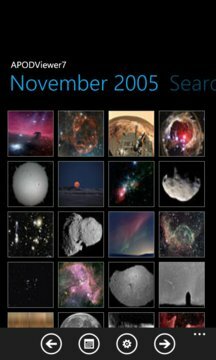 •	Complete APOD Image archive viewing back to June 1995 showing images month by month with the title, date, and a small thumbnail. •	Optional view of the month showing thumbnails only. •	Allows viewing of the detailed image, including pinch to zoom. •	Automated slideshow pans images as it randomly chooses images from the APOD archive. •	Search for specific words in the title and description throughout the entire archive. •	See the images full explanation. •	Save the image to the picture hub. •	Link to view the images original web page. •	Quickly share the APOD image’s link via SMS or Email. •	Save specific images as favorites, viewable from the favorites page. 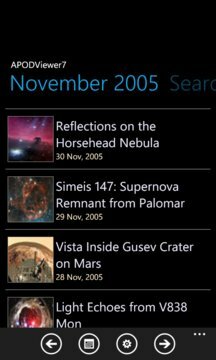 •	Live Tile updates of either user specified images, the latest APOD image, span the latest image across two tiles using the Multi App Live Tile option, or random images from APOD. •	Mirror servers to choose from to download the images from the closest server to you.